When tracing the path of the CGI revolution, two films are usually cited as the beginning of the boom: James Cameron's 'Terminator 2: Judgment Day' (1992) and Steven Spielberg's 'Jurassic Park' (1993). Certainly, these are seminal films -- if it wasn't for Cameron's robo-metal T-1000 and the amazing, all-digital dinos of Spielberg's pop masterpiece, today's blockbusters would look very, very different indeed. But there is another film that is usually left out of the CGI historical canon, but whose mainstream success I would argue is as integral (if not more so) to the advent of all-digital filmmaking as Cameron's and Spielberg's triumphs. That film is Stephen Sommers' 1999 reimagining of 'The Mummy' -- a film so overstuffed with CGI it all but assured digital effects equaled big box office, and virtually rewrote the physics of celluloid action. The basic plot of 'The Mummy' should come as no surprise to anyone familiar with the iconic monster first made famous in Universal's horror yarns of the 1930s, although here he is given a bit of a postmodern spin. Brendan Fraser stars as the hapless Richard "Rick" O'Connell, an American serving in the French Foreign Legion. Assigned to an archaeological dig at the ancient Egyptian city of Hamunaptra, things start to get complicated when, along with the brother-sister team of beautiful Egyptologist Evelyn (Rachel Weisz) and wisecracking Jonathan Carnahan (John Hannah), O'Connell unleashes a centuries-old curse. 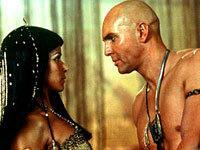 Seems the high priest Imhotep (Arnold Vosloo) once started a forbidden relationship with Anck Su Namun (Patricia Velasquez), mistress to the Pharaoh Seti (Aharon Ipale), and paid dearly for it. But now Imhotep is free from his eternal prison, and he's mighty pissed off. Rick, Evelyn, and Jonathan, along with a rival group of careless American adventurers, must now do battle with the ancient foe and save mankind from Imhotep's reign of destruction. Sommers is a director who seems blissfully ignorant of the word "restraint." Though critics often cite 'T2' and 'Jurassic Park' as being all digital flash at the expense of substance, compared to 'The Mummy' they are intimate chamber dramas. Sommers' barrage of CGI effects is almost non-stop, with nary a scene that doesn't seem to end prematurely, as just another prelude to bigger action spectacle to come. Even the film's locations and sets seem pumped up and artificial, with backdrops painted on with CGI goo and half the props appearing to have been created by computer. This is a far cry from early digital-assisted pics like 'Jurassic' and even Cameron's 'Titanic,' which felt more like flesh-and-celluloid creations with a few CGI bits thrown in. That makes 'The Mummy' the real precursor to today's anything-goes CGI era, as typified by George Lucas' dreadful 'Star Wars' prequels and Sam Raimi's 'Spider-Man' franchise. Thankfully, the cast really saves 'The Mummy' from Sommers' relentless overkill, providing the film with its only semblance of human warmth and emotion. Fraser himself is a fun hero -- though he's physically molded to bear more than a passing resemblance to Indiana Jones, Fraser wisely plays him almost as a buffoon. He's closer to the bumbling Jack Burton that Kurt Russell created in John Carpenter's cult classic 'Big Trouble in Little China' than the cool and composed Indy -- and he's all the more likable because of it. I also admired how Weisz turns her beauty into an asset, turning Evelyn into a repressed bookworm type rather than just another variant on the standard, ravishing James Bond-type babe. And Hannah is great with his one-liners, which come off as genuinely smart and witty. They make a great trio, and (along with Vosloo's imposing Imhotep) rescue 'The Mummy' from complete digital immolation. 'The Mummy' is the first Blu-ray title I have reviewed from Universal, though any excitement is tempered by the fact that this does not appear to be a remaster versus the previous HD DVD release, albeit with a 1080p/VC-1 encode at a higher bitrate. (I would also be surprised if this isn't minted from the same source as the previous D-VHS release.) For a film made so many light-years ago in 1999, 'The Mummy' holds up quite well on high def. I still don't find this one a five-star transfer due to some consistency issues, but it certainly ranks as a significantly high-tier catalog release. The source material remains in fine shape. There is a slight veil of grain apparent in most scenes ('The Mummy' was actually shot on film, despite the extensive CGI) but it gives the transfer a more warm, real feeling and is never distracting. Dirt and blemishes are also not a problem, and blacks are pure. Colors remain quite vibrant but not too overdone, with blues, purples and reds particularly impressive. Fleshtones hold firm as a nice shade of orange. Unfortunately, some of the most saturated hues suffer from slight if noticeable chroma noise, which can sometimes be distracting. Detail is quite good, if uneven. There are shots that are breathtaking, while others appear a bit flatter. Some of this has to do with the CGI, as effects-heavy shots tend to be softer, with the most elaborate longshots suffering the most with all their phony CGI extras. And as I've mentioned in other reviews, I'm not a big fan of motion blur, of which there is a lot in 'The Mummy.' The result is that fast action lacks clarity and fine detail, but so it goes. At least the encode is strong, with compression artifacts such as macroblocking and pixel break-up not apparent. If the video for 'The Mummy' offers no upgrade over the HD DVD, the audio sure does. Vastly superior to the lame Dolby Digital track provided on the HD DVD, Universal delivers a DTS-HD Lossless Master Audio 5.1 Surround track (48kHz/24-bit) that finally deliver the high-res audio 'The Mummy' deserves. 'The Mummy' benefits greatly from lively and engrossing sound design. There is both aggressive use of wall-to-wall discrete effects in the action sequences, as well as more subtle if just-as-effective atmosphere during quieter scenes. I particularly liked the nice use of minor ambiance (such as scurrying scarabs, rustling torches and select score cues during the more suspenseful/exploratory moments). The rear soundfield is noticeably more pronounced in DTS-MA, with directionality much more dexterous, and heft and realism far superior. Imaging, too, is seamless, which elevates the mix to a whole new level. Dynamics are also stronger. High end is more expansive, with better clarity and realism. The score, too, is punchier. Predictably, there is some heavy bombast during the film's third act, which can obliterate everything else in its path. As with the standard Dolby Digital mix on the HD DVD, I did have to compensate a bit with the volume to hear dialogue near the end, but it is far less irritating than some of the most mismatched mixes I've suffered through. It's the only minor complaint I have, though, and 'The Mummy' is sure to thrill. Audio Commentaries -- Director Stephen Sommers kicks things off with a screen-specific audio commentary, where he is joined by editor Bob Ducsay. I will say one thing about Sommers -- he really believes in the movies he makes. Incredibly animated throughout, he bursts with enthusiasm for every scene, and it is easy to see why he is able to attract such a-list the talent to his projects. His enthusiasm on the commentary also easily trumps Ducsay, who aside from a few post-production nuggets seems to be purely along for the ride. But aside from Sommers' relentless optimism, I appreciated his insight into his conception of the material as action-adventure rather than horror (even if I wish this weren't the case) and the choices he made in refashioning the Mummy character as more of a flesh-and-blood creation with a backstory, and not just some dead guy in bandages. And at least Sommers is honest about his obvious lifts from Indiana Jones and countless other movies, with numerous references proving that he's well-versed in modern pop filmmaking. I can't say that this commentary is a must-listen for casual fans, but diehards should not skip it. But wait, there are two more audio commentaries: one with actor Brendan Fraser, and the second with Oded Fehr, Kevin J. O'Connor and Arnold Vosloo. Why these two tracks weren't simply edited together is beyond me -- Fraser is a very likable, earnest guy, but he struggles to hold a whole track on his solo shoulders, while on the other track only Vosloo has an interesting enough character to warrant a commentary appearance at all. These two tracks are for 'Mummy' masochists only. Documentary: "Building a Better Mummy" (SD, 50 minutes) - This is a surprisingly meaty 50-minute documentary (well, at least if you are interested in CGI). Perhaps there is far too much focus put on the film's once-cutting-edge special effects, but I was surprised by the wealth of behind-the-scenes material, the snappy pace, and the better-than-average quality of the on-set cast and crew interviews. Sommers is again a one-man show, with seemingly boundless energy. What is also fun about watching "Building a Better 'Mummy'" is that no one involved was a big star yet, so there's an air of uncertainty surrounding the project that makes for good drama. A clear cut above your usual fluff-minded EPK. Visual and Special Effects Formulations (SD) - This offers four different selectable iterations of five different scenes, from raw effects rendering to the final complete sequence. Storyboard-to-Screen Comparisons (SD) - The comparisons are included for three additional scenes: "Hangman's Noose," "Scarab Run" and "Trouble In Cairo." The presentation is basic and not upgraded for HD, with a typical storyboard/final composite side-by-side format. Deleted Scenes (SD, 2 minutes) - Don't expect much here -- just a quick 2-minute montage of cut footage, and none very interesting at that. The quality of these scenes is also fairly mediocre. Photograph Montage (SD, 5 minutes) - Presented as a single video clip, this collection of promotional and publicity stills is set against an excerpt of the film's score. Only simple Play/Pause control is offered. 'The Mummy' isn't really a great movie, but it is a perfectly capable, quite stylish Hollywood confection. I wished it had been more of a horror movie instead of just another Indiana Jones rip-off, but the film made gazillions at the box office so what do I know? This Blu-ray is also a strong opening salvo for Universal, with video that matches the previous HD DVD release, and audio and supplements that exceed it. Thanks to the inclusion of some Blu-ray exclusives, Universal certainly seems to be hitting the format running.